Yesterday morning was a leisurely one, and we barely left bed, let alone the hotel room, until 11am. We started the day with a walk along the river before lunch at Central Grocery. Turns out that I like Muffuletta a lot for the first quarter of a sandwich, and then not very much for the second quarter. Roger, it turns out, doesn't like olives or salami, so it's really not his bag. We both really liked the bread, though, and the Zapp's potato chips that we had with it. After walking around a tiny bit more, we hopped on a streetcar and headed to the New Orleans Museum of Art, which was smaller than we expected and overly airconditioned for a girl in a sundress. They devoted their entire third floor to art of Africa, Asia and the Americas, almost a third of their collection, and that was impressive to me, and I thought their contemporary art section was well-stocked, considering how not well-stocked their other forms were. I really should have liked the museum much more than I did, and I'm willing to believe that if I had a sweater, I would have. Roger's really the art person in this relationship, so we'd have to ask his opinion for a really good small review. Unfortunately, he's asleep. He sleeps a lot. The museum also has a fantastic sculpture garden, which is enormous and filled with lizards and free and overall a great time. 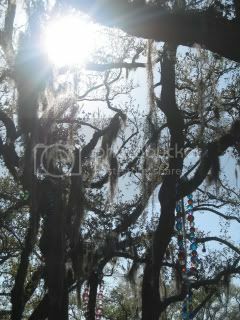 My two favorites were one of oversized glass bead necklaces in a tree, and one by Allison Saar called "Travelin' Light." It was warm and lovely, and we had a great time there. Such a great time, in fact, that they closed us into it, and the guard missed us on his rounds to clear out the place. We walked into the main entrance just as he was about to leave. Roger said, "Wouldn't it have been cool to get locked in over night?" and I said, "It would have been until all the lizards banded together to eat us." We took the streetcar back and hung around the hotel for a little while longer (it's getting near the end of the trip and we're tired), before heading out to Preservation Hall, which I thought was endlessly cool, and which Roger noted was filled with white people who, like ourselves, probably know nothing about jazz. In any event, it's a grungy little hall that was packed for the first two rounds, and emptied out on the third (Roger and I stood outside for the first, inside for the second, and sat for the third), which was nothing at all like what I was expecting, but fun nonetheless. We saw Carl LeBlanc and the Essential N.O. Jazz Band, who were fantastic and personable. LeBlanc apparently went to Columbia, so between sets, he took some photos with a group of kids who were there from the school and chatted him up. Although there were really only white people there, and I'm sure that all of them were tourists, it was great to be in a place with such a wide variety of ages, from college students to senior citizens. I'm really no good at judging music (or anything, really, except books), but it seemed like everyone there was having a great time, and I'm all about that. After that, we strolled around Bourbon Street again, eating a Lucky Dog, which is, I swear, the food of the gods (if a little pricey for a hot dog) and drinking some cheap beer. We rolled into a Voo Doo shop, which the 13-year-old in me it totally digging, and then headed back in for the night. Today: the National Voo Doo Museum and the St. Louis Cemetery 1.